Beautifully set by the golden bay of Santa Ponsa, the Bahia del Sol Hotel is perfectly positioned for a blissful Mediterranean holiday. Soothe away the stresses of everyday life in the luxurious spa, sip a sparkling sangria by the pool, and let all your cares drift away in the refreshing sea breeze. If you’re considering combining relaxation with a cycling holiday in Majorca, this hotel makes a fantastic base. Professional bike service, Rad International Mallorca is based by reception for any repairs, maintenance or bike hire you need. Several of the plush, modern rooms at Bahia del Sol boast fabulous ocean views, and all offer a comfortable night’s sleep. For younger guests, there’s a kids’ club with activities throughout the day and a large, multi-coloured playroom. At the end of the day, make your way up to the rooftop bar and experience a magical sunset backdrop to your early evening aperitif. Whether you’re seeking some downtime, family-fun or a good base to explore the area, the Bahia del Sol Hotel has it all for a sunny holiday. Playa Santa Ponsa beach is just 250m away from the Bahia del Sol Hotel. 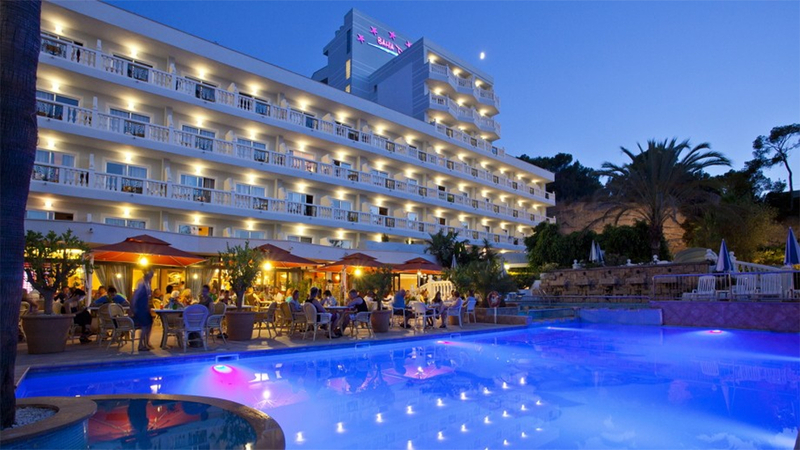 Bahia del Sol Hotel enjoys a central location in Santa Ponsa. There’s bars and restaurants on the hotel’s doorstep, and it’s easy to walk to the other side of the resort via the beach. Hire a bike to explore more of this beautiful area, with several other sandy beaches to explore along the coast. For a fun family day-out, Katmandu Theme Park is less than 7km away. 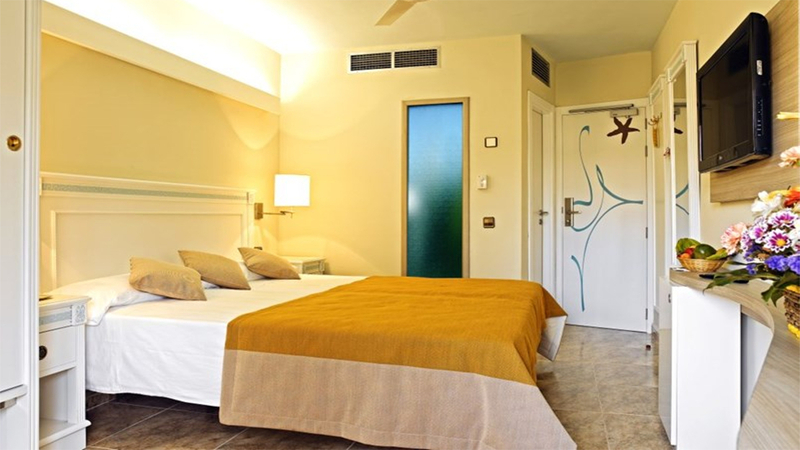 Palma de Mallorca Airport is approximately 30km away from Bahia del Sol Hotel. Sit back, relax and let the staff of Bahia del Sol Hotel take care of all your meals and drinks when you book the all-inclusive package. Breakfast (08:00-10:30), lunch (13:00-15:00) and dinner (19:00-21:30), are served in the buffet-style restaurant. During meals, soft drinks, beer, water and wine are offered. Locally produced alcoholic and non-alcoholic drinks like water, wine, refreshments, soft drinks, beer, spirits, etc are served from 11:00-22:00 (except during meal times). For days out, picnic service is available on request. Details are subject to change however on arrival at the hotel you will be provided with full details for the all-inclusive programme. Enjoy a wide range of hot and cold dishes for every meal at Bahia del Sol’s extensive buffet restaurant. A gourmet breakfast starts the day with a boost, including a good variety of continental favourites, fresh fruit and cooked options. Dinnertime brings exciting themed buffets with regional specialities, show cooking and a special menu for the kids. Wash it all down with a selection of Spanish and international wines, local beer or a classic sparkling sangria.